When one person in a couple or family is affected by Parkinson’s disease, the other family members live with it as well. To keep your care partnering relationship healthy and balanced, it’s important that the care partner finds time to take a break from caregiver duties, has some outside interests and has others they can turn to for support and resource information. Be proactive – find a Caregiver Support Group. Find time to build exercise and good nutrition into your life. Our Chapters and Information and Referral Centers offer an array of programs for partners. Join APDA’s new online community support forum with Smart Patients. Visit the Ask the Doctor section of our website. Our staff of healthcare professionals specializes in all aspects of Parkinson’s disease and will provide resources to address your questions and concerns. Download our Education Booklet called Keys to Caregiving to learn about ways you can handle some of the challenges of being a care partner. When a parent has Parkinson’s disease, the couple may wonder how to talk to their children about the diagnosis. My Mommy Has PD….But It’s Okay is a guide for young children about Parkinson’s disease. Our 5 Tips for Caregivers provide some quick insights that can help with your day to day management. For information on brain donations please visit The Brain Support Network. Improving the quality of life for your loved one by connecting them to a palliative care team that offers pain management and in-home services within the community. For more information please visit Get Palliative Care. 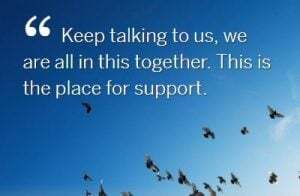 If you need help and you do not see what you are looking for on our website, please call 800-223-2732, 7 days a week, for referrals and information. APDA is here to support you.